Democrat Ann M. Ravel of the Federal Election Committee wants to control political speech on the Internet. According to Ms. Ravel, the FEC can no longer “turn a blind eye to the Internet’s growing force in the political arena.” Thus, an unelected political appointee and two of her Democrat colleagues want to monitor and control political speech on the Internet. Plus, they vow to pursue censorship in the coming year. Every American should be alarmed! Our First Amendment - especially the freedom of speech, press, assemble and petition - allows We the People to know the actions and decrees of our political leaders. Unfortunately and universally, government wants little knowledge of their actions to be shared and minimal oversight by the people governed. Throughout history, governments have attempted to control the facts received by the public. In America, politicians spent years forming cozy relationships with the media to control knowledge disseminated to the American people. Regularly, politicians gave editors and reporters access and inside knowledge to their agendas. In return, the media gave "good" press to the politician and regurgitated the political message – commonly known as spin. Best facilitated by politicians presenting carefully, scripted brief to the media, these thoughts and comments were then incorporated into the major media outlets; ABC, NBC, CBS, the New York Times, the Washington Post and the list goes on. Then, popular writers and announcers fed political facts and philosophy to earnest Americans. Spoon-fed by the media's "information," American citizens generally accepted what they were told and government was competent and beneficent. All was well with the world. Then...came the Internet. Fortunately for We the People, the Internet destroyed the corrupt collusion between politicians and the media. As our access to the Internet multiplies, so does our knowledge of the actions and decrees of our government. Now, we know there were no weapons of mass destruction in Iraq, we can’t keep our insurance or doctor under ObamaCare, the Veterans Administration caused unnecessary delays and deaths, the Centers for Disease Control is incompetent and more bad governance. Increasingly, Americans have come to realize the incompetence, waste and fraud of our government. Knowing the Internet is increasing everyone’s knowledge, governments throughout the world yearn to control the flow of information. At one extreme the totalitarian regimes censor, imprison and execute. 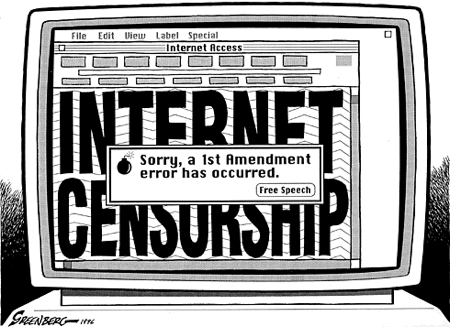 America, with our reverence for free speech, is more subtle - they just want to regulate the Internet. This ploy to regulate political speech on the Internet must be stopped. Constitutional violations should result in loss of job, pensions and garnishment of wages at 50% for life!